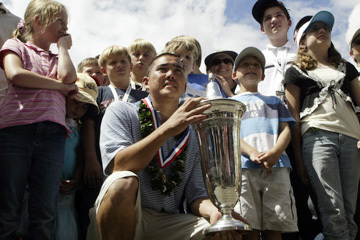 Casey Watabu, of Kapaa, held the trophy after he defeated Anthony Kim in the U.S. Amateur Public Links Championship. BREMERTON, Wash. » Casey Watabu of Kauai won the U.S. Amateur Public Links Championship yesterday, beating Oklahoma's Anthony Kim 4 and 3 in the 36-hole final at Gold Mountain Golf Club. The 22-year-old Watabu, from Kapaa, had 10 birdies, 21 pars and two bogeys in 33 holes against Kim. "I guess I saved my best golf for last," said Watabu, whose only previous notable win came in the 2006 NCAA West Regional. "I can't believe how well I played today." The former University of Nevada player earned the James D. Standish Jr. Cup. If still an amateur, the Public Links winner has traditionally been invited to play in The Masters. "That's the one tournament that I've never ever missed," Watabu said. "It's the tournament that you watch from when it first gets on TV until the end. Knowing that I'm going to play in it is crazy. It's crazy. "I'm going to have a lot of fun." He also received a surprise visit from his parents, Victor and Iris. They caught a redeye flight Friday night from Hawaii to see the final. Casey Watabu led 5 up after the first 18 yesterday in the U.S. Amateur Public Links final. "I told them last night, 'You guys would have a lot of fun out here,' " Watabu said. Watabu put on a show for his folks. He seized a 5-up lead following the morning 18 holes. Then he began his afternoon round with three consecutive birdies to go 7 up and leave Kim with little chance for a comeback. "The morning round really cost me," said Kim, the Big 12 Conference Player of the Year in 2005 who plans to turn professional after next month's U.S. Amateur. "Once you get that far down, it's pretty hard to come back." Kim tried. He got to 4 down after birdies on Nos. 4, 6 and 7. He then sank an 18-foot putt on the 10th for a birdie, igniting the crowd with a fist pump. But Watabu answered at No. 10, draining a pivotal 12-footer for birdie to halve the hole. Five holes later, Watabu ended the tournament with a conceded par. "Momentum is a huge thing in match play," Watabu said. "He kind of had the momentum, but I knew if I made that putt, the momentum could go on my side no matter what." Kim was impressed with Watabu's play. "He played very good golf. Hit the right shots at the right time and made the putts when he needed to," Kim said. "He didn't back down." Casey Watabu watched his shot from the 10th fairway yesterday as it sailed underneath tree branches.